Earlier topic: Slowing down a motor. My C & P pilot has never given me problems before, but this morning I went to print some invitations and when I pulled down the handle to the full extent the rollers get stuck on the ink disk. I have to then pull up on the handle to get them off. It is a loud and jarring movement to get them back down. I did recently take the rollers off to thoroughly clean them. I thought that I may have put them in wrong, but I took them out and put them back in several times, checking the tracks as I went. No cigar. Still sticking. Did you put the trucks back on them? Even a photo might help! As you can see, I can let go of the handle and it will stay in place. I have to pull up on it really hard to get it back into rest position. I just oiled it to see if that would help, but no luck yet. well the image didn’t go through. Let me try it again…. Make your photo smaller or rename the file. Filenames must be only letters and numbers, no special characters or spaces (though the spaces seem to work OK for me). I assume you are rolling onto the disc with ink on the rollers — if without ink, some roller materials are sticky when dry and very clean and that could be your problem. What are the rollers made of? Also, check to be sure nothing has gotten loose between the handle and the rollers that could be jamming things. Remove rollers and cycle the press several times. It should be easy and smooth. If not, it is a linkage problem and not a problem with the rollers. Next, with the roller arms at a convenient location, pull the saddle up strongly to get a good extension. Do this several times. There should be no catch or rough spots. Only spring resistance. Do other saddle. Both should feel the same. My guess, without examining the patient, is a linkage problem. Also, in your photos it looks like the handle is pretty close to the platen link arm — are you sure it’s completely clearing it? thanks everyone for the responses. I am still stumped. I tried all of your suggestions and still sticking. One weird thing I have noticed is that it doesn’t happen when I take the chase out. Thoughts? This likely has nothing to do with your problem, but I think you are due for some new rollers. What is locked up in the chase right now? Do you have grippers installed on the press? Open the press, with the chase in place take a photo of the entire chase and the area below it, as well as the bottom edge of the platen, to post. Then check the gripper mechanism on the bottom edge of the platen to be sure nothing is sticking out that could interfere with the chase when the press is closed. It sounds like there might be a large screw or some other part sticking out that is wedging against the chase when the press is closed. remove your rollers and try it. your handle looks too close like AdLib Press says. I don’t know what removing the chase would do to help this, unless the chase lock is hitting something??? After viewing a movie of this (supplied to Anthony at Boxcar Press) it’s my opinion that the rollers aren’t the problem here. They appear stuck because the whole press is stuck. I think the platen of the press needs to move forward in order to hit the form before the handle is so low. This is tough so I would make sure to eliminate all other possible problems before tackling this. One reason I say this: on our identical model press the handle doesn’t swing down much below the tie arm connecting the main casting to the platen. On your press the handle swings down much lower. You can adjust the platen position this by moving the four large bolts on the back side of the platen. 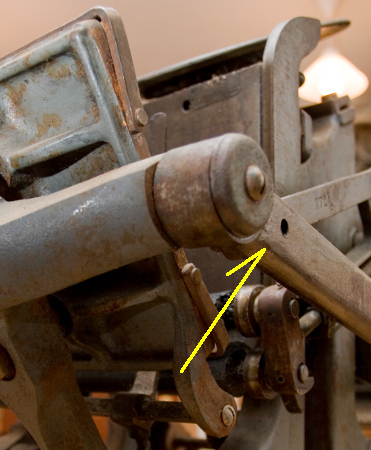 There are two nuts on each of the four bolts holding the platen in place. You need to loosen the ones closest to the feed table a few turns. Do the same amount (ie, a half turn) for all four outside nuts. Then, you should tighten up the nuts on the opposite side of the platen. The effect will be to push the platen out further away from the feed table, and impact the form sooner. This is slow and will take some trial and error. You’ll most likely have to test the impression in all four corners of the platen and make small adjustments to the bolts to even out the impression. In the end the platen needs to be parallel to the bed of the press when it’s impacting the form. I’m inclined to agree with AdLib and DickG. A sudden onset sounds more like a setscrew has come loose on the roller arms, the handle or another rotating assembly. I doubt the platen adjustment would result in a sudden issue. I was thinking there might be grippers on the press that aren’t set far enough apart to clear a plate base which is locked up in the chase. Where can we see that video? Check the ratchet on the back of the ink disk to see if it is sticking. Also, I’d look at this bolt on the link to the rollers… if it backs out, it might catch on the back of the rail when the press closes. In general, I’d also look for any scrapes or marks that indicate parts are rubbing/catching. Hold on a second… Looking back at your first post I see you said you “went to print some invitations” and pulled down the lever and it got stuck. I am pretty sure I know what is happening. You have a larger form on the press than you have been using and are also using Boxcar plates and some heavy paper and are trying to achieve an impression, is that correct? If that is what is going on, your press is doing just what it will do. The fulcrum mechanism on a C&P Pilot involves the press rocking to a closed position where the fulcrum meets two stops- one on each side of the back of the press. This action takes the fulcrum just past the moment of ideal pressure. It is like going over a hump- once you’ve gone over, it takes some force to get back to the other side. Boxcar base? Are your guides hitting the bottom of the base so the platen can’t close all the way. It will make a different sound when the platen closes for sure. It can not clase all the way. I have failed to mention that the handle was broken at the base when I acquired the press. Also, the bolt that holds the handle on must have broken off inside the press when it originally broke. I had a machinist braise it a while back and give me a replacement bolt that has held the handle on (however the broken bolt is still inside.) It has worked well for the past couple of months, however the impression in my work has been almost nonexistent. Then the other day, the above situation happened. I paid attention to all of your responses and tried your suggestions. 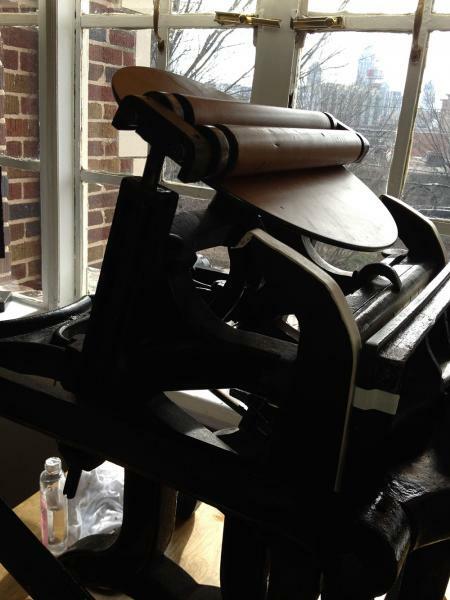 @boxcarpress, we have been fiddling with the platen position by adjusting the bolts (tightening them quite a bit.. but it is an old press and very stubborn.) We also tightened the bolt that holds the handle on. That seemed to help somewhat. The handle didn’t go down nearly as far, but the platen didn’t allow for the paper to fully press on the plates. I messed with it a bunch yesterday, slowly adjusting each bolt to even out the ink. All that said, I knew something was still very wrong so I had someone come to try to mess with the bolts more. And lo and behold the braised handle could not hold up to all of the fiddling that we were doing and snapped again…. So now I am in deeper than I was before with a completely useless press. I live in Atlanta, GA. Does anyone know where I can get the press fully repaired? Anyone know a place I can finish up the projects I am in the middle of? Well, we are not close to Atlanta but we do ship all over the U.S. We can send you an empty crate (about $65) suitable for shipping the broken Pilot to us. This press, once in the crate, will have to shipped by common carrier back to us. We can make those arrangements. Once it has arrived we will analyze what is wrong and provide you with the recommended repairs to make the press function as designed. 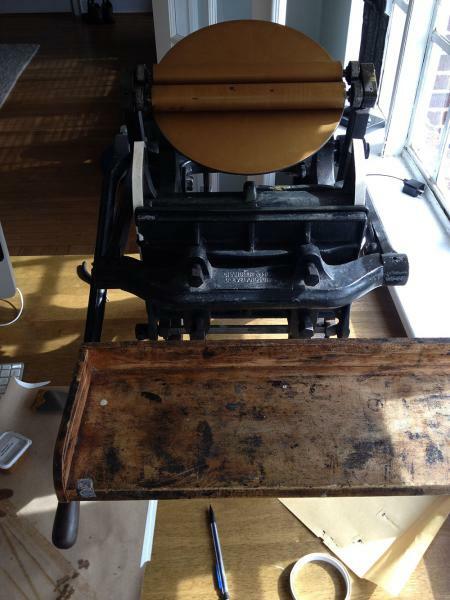 We could also completely restore your press. The return shipping expense is likely to be the same as it will be to send it to us. I would estimate not more than $400 each way. The press crated weighs about 250 lbs. In my opinion the braze failed for two reasons. First there is no evidence that a chamfer was ground along the break prior to brazing, second the braze was filed away to make it look better removing a great deal of its strength. The other unresolved friction/drag problems mentioned above have contributed to the lever breaking but it seams the issues were there all along and came with the sale of the press to you. 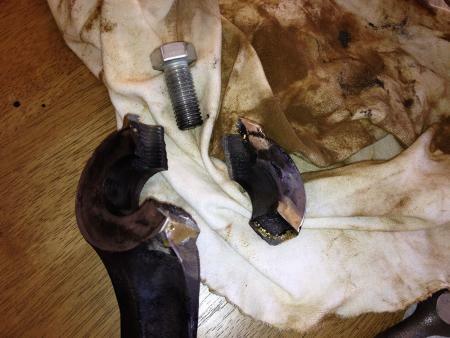 The yoke stub shaft must have been modified from original for there to be a broken bolt stuck in it. Since there is no keyway on this press yoke shaft I can well imagine what damage a sliding lever has done to the shaft. I believe this press needs a fair amount of care. Tom has done a lot of Pilot press parts repair and fabrication for me in the past. He does excellent work.